As the area’s leading pet death care provider, only Peaceful Pastures has its own crematory to serve your needs. Your pet never leaves our care. When a beloved pet dies, owners may choose pet cremation as an alternative to burial. At Peaceful Pastures, we offer cremation services that can be arranged along with special funeral or memorial services. Peaceful Pastures will help you plan and arrange a burial or cremation service. Our services are designed to allow you to focus on your pet’s memory. If your pet dies at your home, at a vet’s office, or at any location, call us. We will respond right away and will speak with you to discuss your options. We answer our phones 24 hours a day, seven days a week. You may dispatch us to receive your pet into our care at the place of death, or you can bring your pet to us. Prior to your dog, cat or other pet’s cremation, we will help you plan a funeral or memorial service and inform you about the pet cremation process. Families often have a short visitation with their pet before the cremation takes place. Following the cremation, your pet’s cremated body can be placed at Peaceful Pastures. Our cemetery, within the rolling hills of the southern Pittsburgh area, welcomes all visitors. Peaceful Pastures offers two choices: private cremation or a communal cremation. Private cremation: With this option, your pet’s cremated body will be returned to you in the urn you’ve selected. 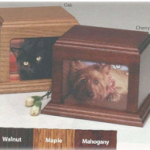 Many pet owners choose to have the urn buried on cemetery property and then design a granite or bronze monument to honor you pet’s life. Families can also place the urn in a niche in a columbarium at Peaceful Pastures, and then visit their pet at any time. Communal cremation: Families who don’t wish to have their pet’s cremated body returned to them can choose a communal cremation. The pet’s cremated body will be scattered on the Peaceful Pastures cemetery property. This option is made available because many people enjoy visiting Peaceful Pastures’ beautiful grounds. Our staff will explain all of the available options that are included with our pet crematory services. We can write a custom service or guide you in creating one of your own. Because pets are family, Peaceful Pastures offers the same options for funeral and memorial arrangements that are available to humans. While burial is a popular option, cremation is another choice that many pet parents find comforting.